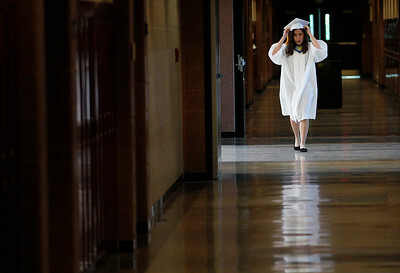 Matthew Apgar - mapgar@shawmedia.com Stephanie Voller of Marengo, 18, walks down the hallway for one of the last times as a student before their commencement ceremony on Sunday, May 31, 2015 at Marengo Community High School in Marengo. 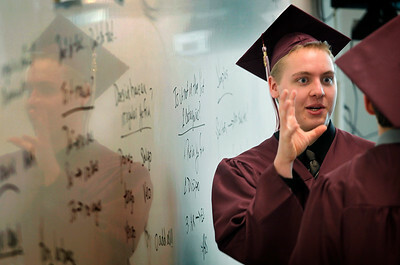 Matthew Apgar - mapgar@shawmedia.com Jordan Dennis talks with a fellow graduate inside a classroom as graduates await the start of their commencement ceremony on Sunday, May 31, 2015 at Marengo Community High School in Marengo. 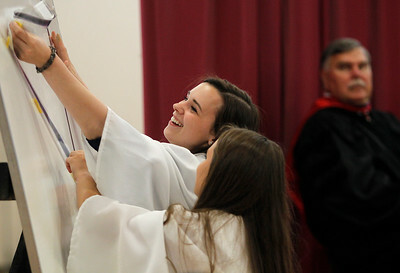 Matthew Apgar - mapgar@shawmedia.com Superintendent Dr. Dan Bertrand watches, right, as Paetyn Borhart, back, and Cierra Volpendesta share a laugh while attaching a triangle shape to a white board during their commencement ceremony on Sunday, May 31, 2015 at Marengo Community High School in Marengo. 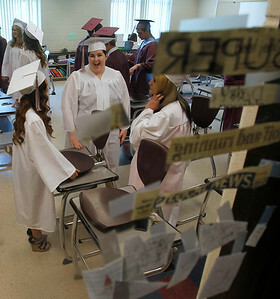 Matthew Apgar - mapgar@shawmedia.com Students prepare to graduate during their commencement ceremony on Sunday, May 31, 2015 at Marengo Community High School in Marengo. 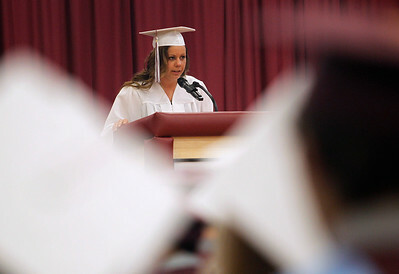 Matthew Apgar - mapgar@shawmedia.com Class Secretary Jacquelin Pulak speaks to the class of 2015 during their commencement ceremony on Sunday, May 31, 2015 at Marengo Community High School in Marengo. Matthew Apgar - mapgar@shawmedia.com Graduates walk toward the gymnasium for their commencement ceremony on Sunday, May 31, 2015 at Marengo Community High School in Marengo.